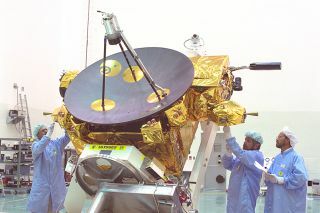 Technicians conduct pre-flight testing of the Ulysses spacecraft. In this historical photo from the U.S. space agency, technicians in Hangar AO on Cape Canaveral Air Force Station do preflight checkout and testing of the Ulysses spacecraft on June 26, 1990. Ulysses, a joint NASA/European Space Agency project, was launched by the Space Shuttle Discovery Oct. 6, 1990. To reach high solar latitudes, the spacecraft was aimed close to Jupiter so that Jupiter's large gravitational field would accelerate Ulysses out of the ecliptic plane to high latitudes. Ulysses observed the sun during a period of maximum solar activity, particularly from 2000 through 2001.